There are thousands of online ‘enthusiasts‘ who are taking the plunge and joining the community of affiliate marketers. With e-commerce booming, and the internet dominating the business world, becoming an affiliate marketer can be a very wise choice if you are want to be making money online. 1. Building a good website that converts. 2. 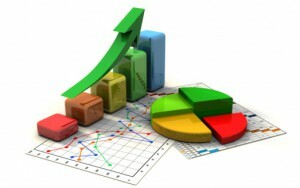 Understanding Search engine optimization. To be successful with affiliate marketing, there are many things you will need to learn. First off you will need to learn the basics of the affiliate marketing business, such how to get traffic as you’ll need a lot of traffic because maybe 1 out of 200 – 500 visitors will actually buy something. Therefore to make money consistently online knowing what you need to do and how to do it is an important aspect of getting an online education. 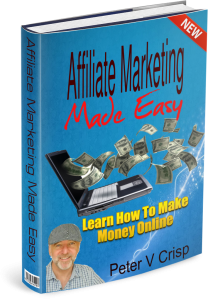 Maybe you could start by getting a copy of this eBook Affiliate Marketing Made Easy. Too many people assume that affiliate marketing is actually a get-rich-quick type of scheme. Some of these people will throw up a couple of affiliate links or banners, then wonder why they never make a single sale or make any money at all. Or worse, they fall for the promise of easy money for little work type scams so often promoted all over the internet. As we have just mentioned one of the biggest factors to making money with affiliate marketing is getting traffic to your site. Even though you may get a lot of traffic, only a fraction of that traffic will actually be buyers. Understanding that SEO can help you get your website into the search engines so that people will be able to find you is only a part of the solution, you not only need to know how to do SEO but how to find and use keywords and get traffic and this takes a little work. How long you’ll need to work on it will depend on how much money you want to make. If you are a quick learner and become really good at affiliate marketing then it will not take much time at all. You can take a look at an example of how you can make money with WordPress here . If however you have a full-time job and are not able to devote a lot of time then this will have an impact on your level of success and the amount of time it takes to achieve any sort of success. If you decide to give affiliate marketing a try, the biggest challenge will be during the first few months. You may feel frustrated when you see that after all your work that you are only making a couple of bucks, you might even find yourself wondering if all the hard work is worth it. However if you get past this point till you get a few sales coming in and you stay committed, the amount of commissions you receive will start growing over time. By sticking with affiliate marketing, you’ll learn more and more as time goes by. You can’t expect to be the best and make a fortune when you first start, it’ll take a lot of hard work and dedication. By putting the time and effort into your education, you’ll be well on your way to making it in the very profitable and exciting world of affiliate marketing. The key here is staying with it and getting to know what to do and understanding your visitors and then being able to determine which affiliate programs you can offer them that will best meet their needs. In addition, there is also the concept of the ‘pre-sale psychology‘ which is the ability to put yourself into the mind of the visitor in order to determine what is required for them to actually want what you are promoting. This is why getting an education, learning the ‘smart’ ways to build websites, how to then promote them, how to create engaging content and then how to use good search engine optimization tools in such a way as to build a long term sustainable online income. Fortunately, you can learn all this and more, in one place and you can start for free. You do not need a credit card to get started. Many individuals are under the impression that you can earn a lot of money with affiliate marketing and not have to invest a penny. Even though the majority of these programs are easy to join, and some are free, you’ll have to invest money at some point in time during your affiliate marketing career. Making it as an affiliate marketer will take time, effort, and a lot of work. The more of these qualities you put into your business, the greater the success you’ll achieve. You should always be willing and ready to stick with your learning to build up your earnings. Even though the system of affiliate marketing may seem overwhelming at first, you should realize that you are surrounded by online support. As a lot of the individuals who join affiliate programs are new to the business. They need individual attention with different aspects of the learning process. The community at Wealthy Affiliate understand this and in fact are second to none when it comes to getting help and sharing knowledge, answering questions and providing support. You will not only receive a great education, unparalleled support but you also receive two free websites that are part of the free starter membership program. Try and find that somewhere else. The websites are practically built for you and you are given a ten lesson video course by the owner of Wealthy Affiliate to get you rolling in the right direction. Of course, before you join any type of program, you should learn as much as possible about the company. It’s actually very easy to research companies, as internet searches are easily one of the most primary sources for information. To be on the safe side, you should ensure that the program and company have been operating for several years, which can be easily and properly be verified. Many organizations and companies have forums and customer reviews and support for those who need advice or assistance. There are a lot of websites, articles, and forums that will make your quest a little bit easier. However, you will find that Wealthy Affiliate is ‘the‘ top rated Affiliate Education Program on the planet for those wanting to learn about affiliate marketing. Remember you can start for free and you don’t need a credit card. Keyword research is one of the first steps towards a successful search engine optimization . You have to be careful when selecting keywords, as it can be very difficult to select the ‘right’ keywords for any website. For a long time, this process of finding the keywords was to make a list based upon the volume of words searched for and this is where many keyword searches go wrong. There are plenty of websites which get high levels of traffic but they end up not getting many sales. One of the important elements you will learn at Wealthy Affiliate is when doing keyword research, it’s recommended to do thorough research to find the best keywords used by real people searching to find products and services online, and find out what words and phrases are being targeted by your competitors who are also marketing on the internet. There are numerous tools available which will help you identify keywords however the challenge here, is to determine which keyword is the best to generate traffic. The landscape of search engines have undergone some drastic changes over the years and determining the best can be difficult and confusing for many. 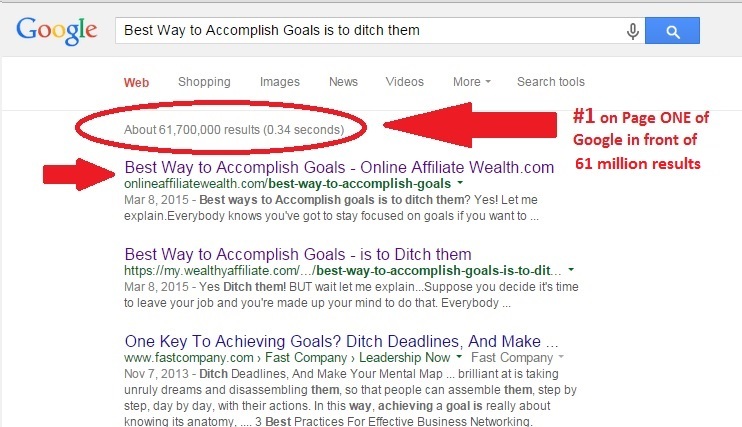 However, at Wealthy Affiliate, they have an awesome keyword research tool that makes getting ranked on page one of Google a breeze. To find out more about this tool and how you can get your pages and posts and website on page one of Google see my review using the link below for more information. Make no mistake, getting a ranking in Google search engine is important because this is what brings organic traffic to your site. 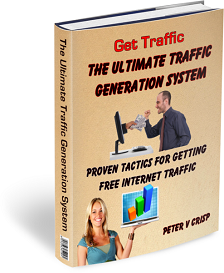 This is free traffic and the education you get at Wealthy Affiliate will help you understand the power of this type of traffic and how to get these types of Google rankings for your pages and posts. According to Google, the pages that are #1 ranked will get about 42% of clicks from the traffic that searches page one. If a keyword is being searched by 1,000 people per month then, 42% of them will click on the first result with the balance going to the rest of the pages as indicated above. So the #1 ranking site will get about 420 people per month for that particular keyword. So you have a choice. You can be one of the 90% of affiliates who make less than $100 a month. Or you can get an education from wealthy Affiliate and become one of the few top 10% who learn how to make a full-time income. So why not discover how to learn about affiliate marketing and create a better future. Because trying to make money online can be difficult. Most people fail because they get frustrated and give up before they ever put all the pieces together. But, it’s only tough if you ignore the advice of the right people and persist in attempting to reinvent the wheel. Yet there is a proven blueprint. An easy way to make money that cuts out all the pain and struggle and you don’t need any techie skills to make money this way and best of all it easier than ever to learn everything you need to know. The book is awesome and so are you for leaving a comment, Thanks! I definitely agree with your recommendation for Wealthy Affiliate I have been using it for the past year and I wish I would’ve found it sooner! The reason are it provides a family oriented training that consists of helping each other to become a better affiliate marketer! Anyone that wants to learn how to make an extra buck should definitely try it out! Hey, Eddie. The community at Wealthy Affiliate understand this and in fact are second to none when it comes to getting help and sharing knowledge, answering questions and providing support. You will not only receive a great education, unparalleled support but you also receive two free websites that are part of the free starter membership program. This is a great post on how affiliate marketing needs to be viewed. I appreciate your honesty on the subject and showing that it does take time and effort to build a successful site. I am in my first 2 months and can attest to the work being harder at the beginning as I build content on my site. There are struggles with this at times and I do get frustrated. But when this happens I turn to the community at Wealthy Affiliate and find support and inspiration. This is key to me personally as I go through fits of productivity then I drift, particularly when I get stuck, but being able to get help 24/7 has really helped me push on. I am aiming for that 10% Peter, nice job on this page. Hello, Wade. Yes, one of the biggest factors to making money with affiliate marketing is getting traffic to your site and even when you get a lot of traffic, only a fraction of that traffic will actually be buyers. Understanding that SEO can help you get your website into the search engines is only a part of the solution. You also need to know how to find and use keywords that gets traffic and this takes a little work. This is why about 90% of affiliates actually make less than $100 a month. As an avid affiliate marketer, I found your article raised interesting points. Your guide is very clear and to the point, which is something you don’t see so often, in the make money online industry. And yes, Wealthy Affilaite is definitively one of the best place to dive into affiliate marketing and how it works. The best part about it is that you have a community to support you, something crucial to your journey, in my opinion. Hello, Anh. Yes, you have a choice. You can be one of the 90% of affiliates who make less than $100 a month. Or you can get an education from wealthy Affiliate and become one of the few top 10% who learn how to make a full-time income. So why not discover how to learn about affiliate marketing and create a better future. Because trying to make money online can be difficult. Most people fail because they get frustrated and give up before they ever put all the pieces together. wow! that’s an amazing post on affiliate marketing. The best I have seen actually. It gets you to know the reality of the hard work needed to make actual money. I love how you emphasize on training. Most don’t and I think that’s why most marketers fail. They forget the learning stage is the foundation to any success. If I wasn’t already involved in Wealthy Affiliate, I would have sign up for free right away. I highly recommend your viewers to do. It is really an amazing training with the support of a huge community. Hello, Armelle. Thank you for your comments. The biggest challenge comes during the first few months and often times people may feel frustrated when they see that after all your work that they aren’t making a buck and they start wondering if all the hard work is worth it. However if they get past this point till they get a few sales coming in and stay committed, the amount of commissions they receive will start growing over time. So the message is when you first start, itâ€™ll take a lot of hard work and dedication and Wealthy Affiliate is agreat place to get the right education. This has got to honestly be the most informative and well written post I have seen in a super long time. You explained everything about affiliate marketing perfectly and precisely, I have not seen anyone do it so well. For anyone reading this, Wealthy Affiliate is absolutely the way to go, I have tried it and gathered lots of wealth because of it! Thank you! The titles are great and it’s impossible to get confused. You kept it simple, yet very informative. You also chose the right color -> blue, Blue stands for security, guarantee, trustworthy, wise choice! Despite that everything looks fine to me. Great article on affiliate marketing. Very easy read and I have to agree 100% about Wealthy Affiliate! By far the best there is when it comes to building an online business. I see that you have an email opt in in place and awesome that you offer a free ebook as well. Great work, keep it up! I posted comments on your site. Site looks great. Very easy to read. I did notice a small format problem. When you use a square screen content is not wrap around picture properly. I liked how you invited us to get your book. It is a great way to get comments. I favorited your site. I thought the layout was excellent and can be used as a great supplementary tool in combination with the wealthy affiliate site training. I especially enjoyed your section on real estate. The books interested me, but I am also a fan of lectures. Do you know of any good live seminars I could attend to learn more about real estate? You are giving some very good advice about learning affiliate marketing. I think it’s the easiest way to make money online, though on the other hand it’s not as easy as a few years ago. There’s more and more competition online nowadays. I saw that you’re a member of Wealthy Affiliate, and I think it’s the best place on the internet to learn affiliate marketing and how to make money online in a honest way. Some great advice here Peter! Use to be a member with Wealthy Affiliate myself and can vouch for their services. It’s a great community too. Interesting, diagram on google search results, it’s hard to get up there for any keyword but if you put the time and focus on long tail keywords its possible. Hey this is a great guide to affiliate marketing. I’ve been doing this for about 8 months and have had a little success, just no money yet. reading this gave me a lot of great tips and can see a lot of things I’ve done wrong. I like your tips on getting traffic. Seo is tough but if you can get it down it can be really great for your website. I have heard great things about Wealthy Affiliate and I now I know I have to check it out. You seem to understand Search engine optimization Sr., I have been trying to learn about optimization for a month now. I have a question, How imported is the optimization for your web site and where do Ii go to see if my keywords are used by real people and how long will it take to make money online. I like your articles as they are written in such a friendly and professional way! You always try to point most important things of the topic with videos or pictures. Do you have any recommendations about Black Hat SEO for affiliate marketing? Have you ever tried them? What are your results? Hello, Simon To be successful with affiliate marketing, there’s many things you will need to to learn. First off you will need to learn the basics of the affiliate marketing business, such how to get traffic as you’ll need a lot of traffic because maybe 1 out of 200 â€“ 500 visitors will actually buy something. Most people create a website they choose something they are passionate about so it’s more a hobby than work, money really isn’t all that important when you are just starting out. And you really shouldn’t be even thinking about money at this time, although it is nice to log into your affiliate program and see you made $$, but if you are just starting out I wouldn’t worry about it, in time it will happen. There are plenty of places online to learn all about affiliate marketing though I am already a member of Wealthy Affiliate it is my most recommended resource for online education. Wealthy affiliate teaches you all about affiliate marketing and how to become successful with your business online, plus they have fantastic training on search engine optimization and so much more. Probably the most effective way to do this is affiliate marketing and Wealthy Affiliate is such a place to learn about how to do this. Great information Peter keep up the good work. Once again great article, I’ll definitely be subscribing and following the blog for more awesome content. Great information on becoming an affiliate marketer and the importance of learning SEO and exactly where they can learn all of this in one fantastic place. Wow Great information and a good read. Has got me very inspired I look forward to reading more on this site Thank you for the wonderful content.